There has been quite a bit of furniture shuffling around here. Just by shopping my house I can move things around for a whole new look. 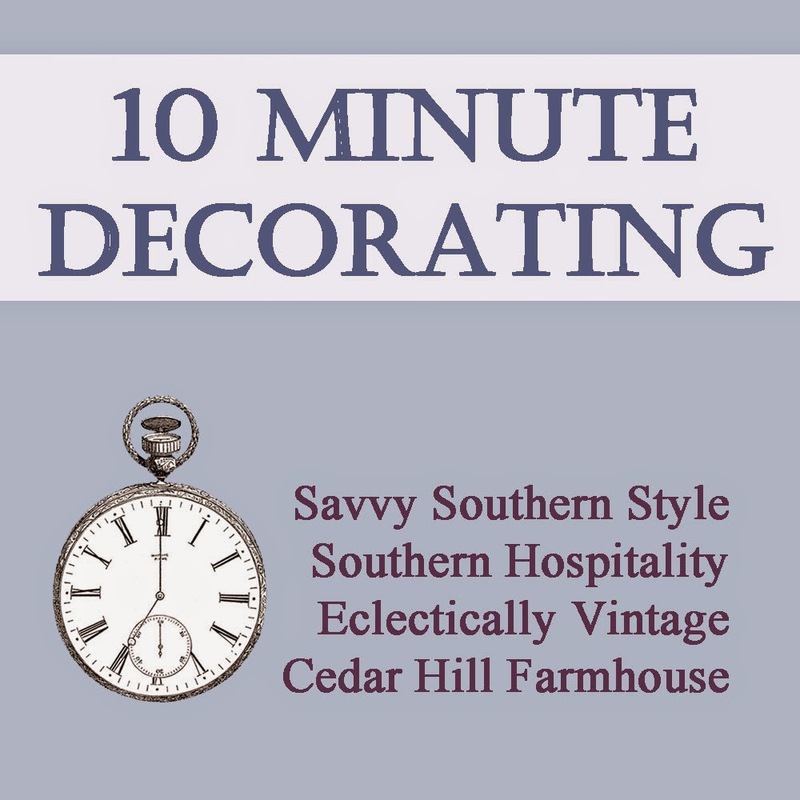 That's the best kind of budget decorating and it can be done in less than ten minutes, too. I decided to use this larger round white table in this spot. It used to be in the other guest room before I placed the antique French table in there a few months ago. This table had been put in the bonus room next to the extra guest bed. Are you staying up with me? I bought this table several years ago and painted and distressed it. This is a much better fit next to the bed. I also swapped out the metal wire basket for this little antique basket. I love the texture this adds. The green chippy table has moved besides Mr. Savvy's chair and the sofa in the great room. This is a temporary fix until I find a better table. This little table is vintage Ethan Allen that I bought a few years ago at a flea market and it is a bit wobbly, but will work for a bit. Here is a trick I came up with to make the table level since part is on the thick rug and part isn't. I just grabbed these two tile coasters I had and voila the table is level. So you get a free tip with this post, too. 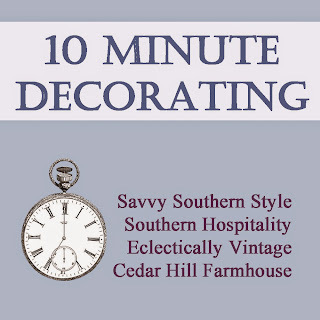 I hope you will check out some more 10 minute decorating ideas in the links below. Love the switch-a-roo ... you can really appreciate the beautiful chippiness of your green vintage table now being in your light-filled great room. I so love a great "shuffle"....keeps things interesting and fresh....love the table in the Farmhouse Guest Room...it was meant to be there! You are a fantastic home shopper! :) Before my boys were born, I staged homes and this was one of my most favorite things to do for a client. They loved it because it saved them money but it also gave new life to things, in different settings. Now you got me inspired to "go shopping"! I had a similar table that was passed down to me from my Grandmother. When we moved to Florida from Ohio, someone stole it off the Moving Van (Allied). We have been here 11 years now, & I still can't get over it!! I never chime in on other people's comments, but I felt compelled to when I read Nancie's. We have been ripped off by a moving company, too, (North American Van Lines), but I don't hear anything good about any of them any more. A sad state of affairs. People do have to move and use large carriers sometimes, and someone needs to come up with a better option than hiring a common carrier. Anyone have any ideas? I like your small tables. They can be used almost anywhere! My favorite is the white chippy one. It has such interesting lines. One can always appreciate a good "Savvy Shuffle" ;) I like how the lil' green chippy table picked up some of the green in the lamp too! Love doing the furniture shuffle...your switch a roo looks great! It's always so much fun to do that! I shop around my house and move and rearrange things constantly too!! I love that white table its gorgeous and it looks perfect in your guess room! Thanks for the great idea of how to level a table too. You are so clever!! The table looks great in the guest room, Kim. 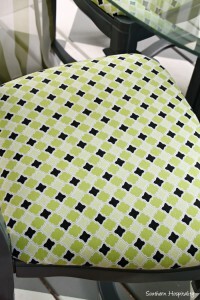 I really like the green one in the family room too, just sems to "go" in there!! It is hard for me to "shuffle" furniture here but I can change out vignettes which I love. Today I am working on a new mantle look for summer. I did a new coffee table vignette yesterday with some great finds!! Have a fun weekend!! My favorite kind of decorating. I love moving things around. 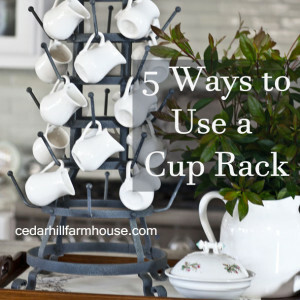 Great tips and we probably all have enough "stuff" to do this all the time. I really like the shape and the legs on the white table too. Love it! Nothing like the thrill of moving things around for a new look! And your things are all just lovely and would be awesome to have to move around! Love that table! Great post, Kim! Wonderful tip!!! LOVE the way you switch things up! Great Switch up Kim. Love that green chippy table. Looks awesome. Kim- I have that SAME little Ethan Allen table and mine is painted almost the same color...maybe a bit more bluish. How funny! I think furniture is easier to move than people! All of the re-arranging looks great! Love both tables. You are talented in decoration. I take too long time thinking about swapping things . Many thanks you shared this. I love that little green chippy table. I tend to move small furniture a lot as well! what I want to know is if mr.savvy is like my hubby and doesnt even notice the switcheroo's that you do?